Neebinnaukzhik means “summer evening” in the Ojibway (also known as Chippewa) language of the Great Lakes region. When Neebinnaukzhik Southall was growing up, she made handcrafts — friendship bracelets, dream catchers and beaded animals — and sold them to family and friends. She called her business Summer’s Specials. Despite the emerging pride that she sensed in Native communities, Southall was concerned with what she found in her studies. In preparing for her senior project, she saw that Native Americans were poorly represented in professional associations and other parts of the graphic design world. “It’s a voice that seems lacking. I wondered why. When I started my research, I didn’t know any big designers who are Native Americans,” she says. Through her exploration, she discovered the work of Victor Pascual (Navajo and Mayan), Mark Rutledge (Ojibway) and the Buffalo Nickel Creative, cofounded by Ryan Red Corn (Osage). She also found work by white designers that presented Native cultures in a sensitive and powerful way. Inspired by these examples, she has set out to combine contemporary design with traditional motifs in her own work. 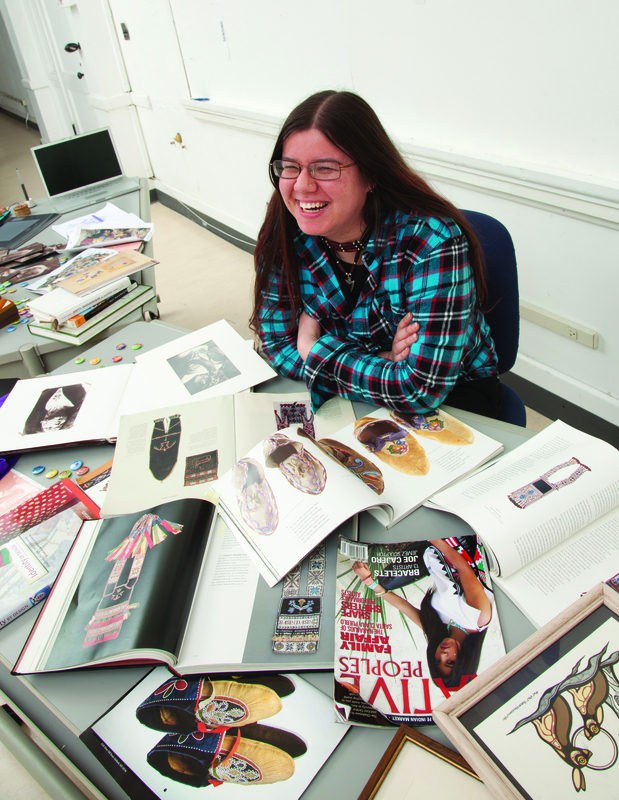 For her senior project — Then and Now: Asserting Anishinabek Identity Through Indigenized Apparel — she is creating designs for clothing (T-shirts and hoodies) that echo traditional symbols from her mother’s people, the Chippewas of Rama First Nation in Ontario, Canada. Anishinabek is the collective name for Native people of the region, and the thunderbird and underwater panther carry powerful meanings for them. These symbols appear in Native beadwork and quillwork. Her immediate goal is to respectfully integrate such images with modern forms that appeal to a young generation. “Neebin approaches every project with a fire and intensity,” says Andrea Marks, associate professor in the Department of Art’s graphic design program and Southall’s mentor. “She’s very proud of her heritage and she has brought that with her from the beginning. It’s been interesting to see how she threads that into her projects. “I can see the passion she has for her culture and wanting to give something back and empower young people. She is very secure in who she is,” Marks adds. In addition to Chippewa on her mother’s side, Southall traces her ancestry to Iroquois and European cultures from her father. Being of mixed ethnicities has been both a struggle and a gift, she says, since she has felt a need to clarify her personal identity and to bring people together despite their differences. And she recognizes that design inspiration for Native people has come from other cultures (European religious art, Persian rugs) as well as indigenous experience. Southall hopes to bring her spirit and design skills to the Chippewa of Rama First Nation tribal center or to another organization that promotes Native American culture, such as the Smithsonian Institution or a Native American educational foundation.